At Fuji Xerox Printers, colour and black and white printing is the result of integrated design. The print engine, toners / ink sticks, paper / transparency film, and software must all work together to provide the best image quality and most reliable printing. If you’re not using genuine Fuji Xerox consumables, you’re not getting the print quality and performance you paid for when you bought a Fuji Xerox printer. Genuine Fuji Xerox consumables and supplies are engineered and tested by Fuji Xerox to work with Fuji Xerox printers. This is no coincidence. This tried and true combination delivers the best possible results. 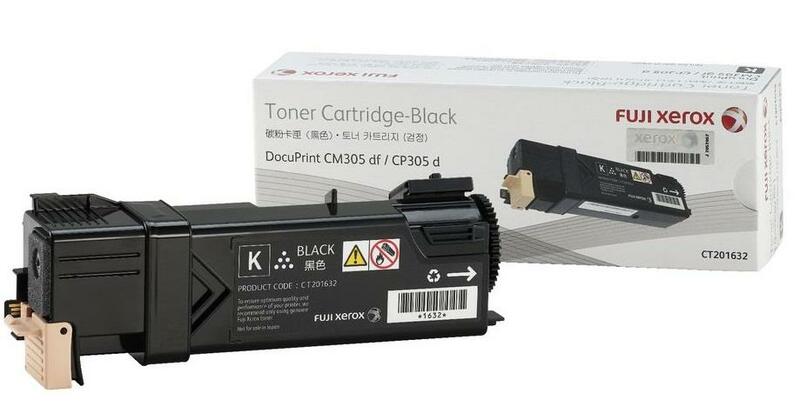 Our Original Fuji Xerox CT201632 Black toner cartridge is a replacement toner cartridge for Fuji Xerox monochrome laser printers model DocuPrint CP305d/ CM305df. The Original Fuji Xerox CT201632 toner cartridges deliver super quality black text documents and sharp images, and can satisfy your needs for frequent printing at low cost. With our Original Fuji Xerox CT201632 toner you can print up to 3,000 pages based on 5% page coverage.